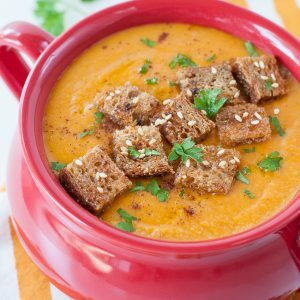 Easy Roasted Carrot and Sweet Potato Soup with garlic bread croutons: this velvety vegetarian soup is full of flavor and so easy to make! Peel and chop you veggies, drizzle with EVOO, and sprinkle with a pinch of salt and pepper. Roast on a lined baking sheet on the center rack for 30-40 minutes. Bring a medium pot to medium-low heat and melt your butter. Next add the flour, slowly, whisking into the butter to form a roux. Stir constantly while the roux thickens, then slowly whisk in your veggie broth. Add your roasted veggies and season with 1/8 tsp cinnamon and 1/8 tsp salt, adjusting amounts to taste as needed. You can also thin the broth to your idea of perfect consistency using a little extra broth! My husband prefers thin soups; I like mine thick! Both are glorious! Simply adjust seasoning to taste if you add additional broth, easy peasy. Blend soup using an immersion blender, or in batches using a blender or food processor. Serve hot, topped with a sprinkle of cinnamon and crispy garlic bread croutons. Enjoy! For the optional garlic bread croutons: pre-heat oven or toaster oven to 350 degrees F. Chop bread into small cubes, drizzle with garlic-spiked butter with a pinch of salt, and toss to coat. Top with sesame seeds (optional but tasty) and sprinkle with paprika. Toast until golden brown. Nutrition facts below are an estimate provided by an online nutrition calculator. Calculated before optional toppings added; adjust as needed.